Here we go with my monthly round-up of films not featured in depth elsewhere on the blog. This feature will change and become smaller over the coming months as I am starting to write long reviews of more and more films that I see. However, I am sure I will never have the time nor desire to write in detail about every film I see, so expect it to stick around in some form. The Raid: Redemption (2011), Gareth Evans – This is definitely one of the better action films of recent years. Deliciously violent and stylish. I wouldn’t say it is particularly innovative, but it just executes all of the elements in an action film really bloody well. The fight scenes are really slickly shot, with a dynamic camera showing absolutely everything. One of the coolest films of 2012. 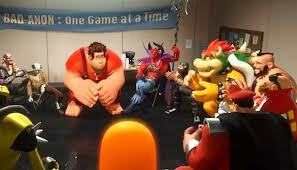 Wreck it Ralph (2012), Rich Moore – This was probably the best animated film of last year. A really fun computer game world has been invented, with the engaging characters to back it up. Sarah Silverman voices the main female character who is a wonderfully empowered female role model, the kind of which is all too rare. The relationship between her and Ralph forms the core of the film, which explores some really weighty themes whilst striking a balance between not being too dark and not too frivolous. Black Water (2007), Andrew Traucki & David Nerlich – This is a very tense, sharp Australian creature feature rocking a killer crocodile. It is nicely shot and well paced. A cleverly utilised soundtrack helps with the latter. You don’t get too bored in between the action high points. An interesting dynamic between the three characters stuck up a tree adds greatly to the narrative which is slight. Some of what happens is quite confronting whilst the last third features some nice twists, without being too over the top about it all. Life of Pi (2012), Ang Lee – An interesting film full of ideas. Which in some ways the much maligned framing device is key to teasing out. I liked the notion of religious pluralism that is examined early on. The supporting of the notion of human exceptionalism in my reading of the film I was not so fond of though. The big late reveal I did not like initially but it grew on me as time passed. It is a clever film that leaves multiple readings of the film acceptable to the viewer such as this one. And of course as everyone has said, the film does look amazing. Les Miserables (2012), Tom Hooper – I thought my mind would wander endlessly in a 2 hour 40 minute musical. But this film engaged and captivated me throughout. I think everyone is really good in this, even the much trashed upon Russel Crowe. I think the only real weak link was Eddy Redmayne who doesn’t have any gravitas or singing voice. The young floppy haired bloke is absolutely incredible though. Blessed with one of the best character narrative arcs in all of literature, this is pretty impressive stuff. The close-up heavy style does occasionally make it look too much like the characters are singing into the mirror at home. But that is a minor quibble against a pretty excellent flick. Django Unchained (2012), Quentin Tarantino – Hmmm. You have to see it because it is the new Tarantino flick and he really is one of our most original directors. But I think that his habit of taking the viewer out of the world of the film does not work too well here. It’s violent of course, but it feels like violence for violence’s sake rather than Tarantino’s usually stylish bloodletting. I just felt it got silly towards the end. Both Dicaprio’s and Samuel L. Jackson’s characters are pretty daft. But the performances of Waltz, Washington and especially Foxx are worth seeing the film for. As is much of the rather fine first half. The film is far, far too long though. Hitchcock – I loved so much of the first half of this film – Hitch’s search for a new project, settling on Psycho, the way the real life case was weaved in. But this last aspect, as well as the rest of the film fell off strongly. Alma and Hitch made films for over 50 years, one of the great love stories. But the second half of this is just aspersion after aspersion especially against Hitch. It is great to see Alma Reville finally get a small amount of the vast attention her career deserves. Hopkins and Mirren are really fantastic in this. 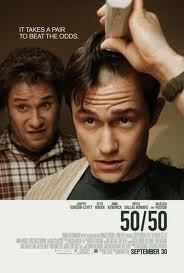 50/50 (2011), Jonathan Levine – This is one where I cannot really see the hype. I thought it was pretty poor. I didn’t find it at all funny, rather crass, sexist and unintelligent. Even worse for the subject matter, I thought there was very little heart in the film or examination of psyche. Whilst it is great to see Anjelica Huston onscreen again, the usually excellent Joseph Gordon-Levitt is strangely flat here. There are a couple of nice, tender moments toward the end, but for me it was too little too late. A shallow experience, a tale of two jerks rather than two best mates helping each other through a terrible time. Snow White and the Huntsman (2012), Rupert Sanders – This aims for pretty epic and succeeds in being pretty average. The increasingly engaging and charismatic Chris Hemsworth is just about the only bright spot actually and his Huntsman is the most interesting character. This is a meditation on beauty, what it means in society and what some will do to maintain it. But it is an utterly unaffecting film. The usually excellent Theron is not at her best here in a scenery chewing turn whilst Kristen Stewart does not convince at all as Snow White. The Hobbit: An Unexpected Journey (2012), Peter Jackson – My least favourite film of 2012. Kind of says it all really. If 48 FPS is the future of cinema as Peter Jackson claims, I’m not going to watch too many films in the future. The visuals distance the audience so much so that there is no way into this world for the audience. The script is woeful, especially the attempted lighter moments. Horrid expository dialogue, woeful effects. Someone needs to learn to say no to Jackson, because despite all his positives as a director, his excesses need reining in. Damn that’s a lot of films that you did not review…. I loved The Raid, best action film I had seen in a long time, Loved Django, most realistic portrayal of slavery I had seen on film, I didn’t mind the Hobbit, then again I saw it at a fancy theater where they have waitress service and Stone IPA on tap. I think I liked Hitchcock a bit more than you. The reason for that is probably because I just watched that HBO film the Girl about Hitch… now that is a hatchet job…. made Hitchcock look like a sunny biopic in comparison. Cheers for commenting. I think if I wrote long reviews of everything I saw, I would not be able to squeeze in watching as many films. I remember hearing a little about that HBO film when it was in production. Shame to hear it was such a hatchet job. I think the reason I probably sounded relatively disappointed with Hitchcock is because I absolutely loved the first half. It really had me sucked in. But the second half just didn’t work for me. Great post, Tim. We agree on a lot and disagree on a few as well. I thought The Raid was cool and loved the fighting sequences, but there was zero story or character development; I missed that. I liked Life of Pi a lot the first time but found out it didn’t hold up so well after a second viewing. I prefer the book, but the visuals in the film were astounding. Haven’t seen Wreck-it Ralph or Les Mis. Really looking forward to those. 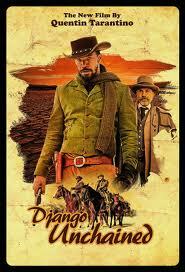 Agree about Django. Too long, and some of Tarantino’s stylistic choices take you out of the movie. Hated his cameo. That scene was so drwan-out and unnecessary, not to mention he’s a dreadful actor. Loved DiCaprio, Waltz and Jackson, though. And the soundtrack. And the cinematography. And the costumes. Hitchcock was somewhat enjoyable but I found it too light. Loved Mirren, though, but found Hopkins’s makeup too distracting. Sorry to see you didn’t like 50/50. I loved that one and still consider it to be one of the best films of 2011. I thought the writing and cast were superb. Agree about SW&TH. So boring, so blah. Charlize Theron was so incredibly over-the-top in a bad way. Hemsworth and Stewart weren’t good either. The best thing were the visuals, IMO. And totally agree on The Hobbit. I HATED THAT ONE SO MUCH. Ugh, so silly and boing and eternal. Thanks for the lengthy comment Fernando. Love that you took the time to share your thoughts. What you mention as not working for you with The Raid, was actually part of the film that I loved. No messing around with plot etc, just straight into the spectacular action sequences. I was going to write about Tarantino’s cameo, but ran out of space. I absolutely despised it. All his cameos are so egotistical. Wants to be the centre of attention. I always ponder them in relation to Hitchcock’s. His were kind of cute. It was fun trying to spot him in the background. But he knew it wasn’t about him, so he didn’t drag them out and want to be the centre of attention. Yep, think we were definitely in strong agreement on The Hobbit. Exactly. Egotistical is the word. Hitchcock’s approach was so much better, I agree. Sorry for the insanely long comment!